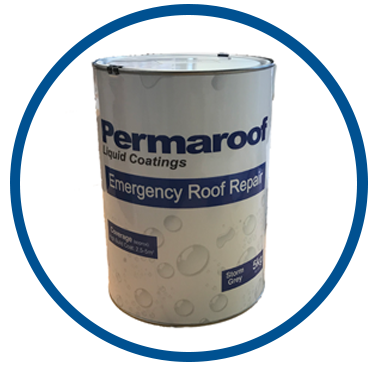 Permaroof UK introduces the revolutionary solution to all types of roof repairs. Ideal for carrying out repairs to flat roofs, pitched roofs and gutters; suitable substrates include weathered asphalt and bituminous surfaces, concrete, brickwork, fibreglass, felt, metal (galvanised and ferrous). The product can be applied by brush or with a squeegee. Coverage rates: High build Coat: Between 1Kg - 2Kg/m2. coverage rates are dependent on roughness/porosity of substrate. Cure Times: Usually to 6-7 days depending on temperature and thickness of coating applied. Note: The product may remain soft for a further period depending on climatic conditions, this is not detrimental to the waterproofing qualities of the product. Any foot traffic during curing periods must be avoided. Please do not hesitate to contact us if we can help with further information. Please note, not suitable for timber, balconies, walkways, or new, aged or plasticised PVC. You can find the Permaroof Emergency Roof Repair here.